Some of the most commonly accepted ways to prevent cold and flu are: gargling, hand-washing, and use of face masks. However, this is not enough! In this article, we'll let you know how you can make your body 'harder' to catch a cold. The secret strategy is surprisingly something that you and everyone else are doing every day. In addition, you'll also find out how this secret strategy effectively transforms your body to help it fight and prevent cold. Risk of Catching Cold Depends on One Important Body Cell? When viruses or bacteria enter our bodies, an important defense system will help prevent it from entering into the cells. This defense system is made up of cells called ciliated cells. One of their main functions is to move things along like fluids and foods, and at the same time, to propel foreign substances such as bacteria and viruses. Ciliated cells are found in many parts of the body especially on the nose and throat up to the inside of the bronchi leading to the lungs. 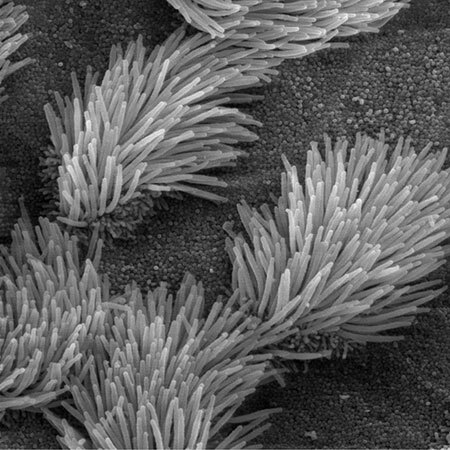 When ciliated cells are healthy, they wrap viruses from the body through mucus. These are then released by the body through sputum, or are killed by gastric juice when it is carried into the stomach. This whole process protects your body from viruses. However, if these ciliated cells are not functioning normally, then this will give opportunity to viruses to invade the cells and multiply. Therefore, what should we do to keep our ciliary cells healthy? "Drinking Water" Makes Your Body Harder to Catch a Cold?! The major reason why ciliated cells can weaken is simply because they are "dry". Studies show that by just "drinking enough water" and staying hydrated can already make a huge difference in boosting the activity of ciliated cells. In fact, people working in a room with high humidity (especially during summer) will feel weak after two hours if they are not properly hydrated. However, people drinking enough water can keep working vigorously in that same room and environment. Remember that mucus is necessary for the ciliated cells to move smoothly all over the body. If they're dried then the ciliated cells will be unable to work well. However, maintaining good water intake helps the body secrete lubricating mucus that helps ciliated cells perform their duty. In turn, this makes your body feel active and stronger. Not only that, all the cilia in the body including those on the nose and lungs will moisten only when you drink enough water. It is quite difficult to feel thirsty during winter compared to summer, and your body will therefore have less moisture in it. It is ideal to take 8 glasses of water (or 2.5 liters) per day to remain hydrated. Foods you eat already contain some amount of water. Typically, your body takes approximately 1 liter of water content from foods you eat each day. Therefore, you should drink at least 1.5 liters of water additionally per day. NOTE: Beverages such as alcohol, coffee, green tea, and black tea are diuretic, so it is advised that you don't take too much of these drinks. IMPORTANT: Activity of ciliated cells may weaken when body temperature falls (e.g. during winter or cold weather). Your nose begins to dry out during low temperatures and gives opportunity for respiratory viruses to multiply. Aside from drinking enough water, wearing a scarf is recommended to warm your neck and ensure normal activity of the ciliated cells. Drinking enough water plus the use of PYRO-ENERGEN therapy can be a very potent combination in preventing and fighting cold and flu. The PYRO-ENERGEN electrostatic therapy machine has excellent records in completely eradicating viruses that cause influenza and cold in a short period of time. When the body is surrounded by the PYRO-ENERGEN's special electric field, it creates an environment wherein viruses cannot reproduce, multiply, and will eventually die. See "How PYRO-ENERGEN Works" for more information. 1. "Why You Should Wear a Surgical Face Mask?"